At APEX, we’re committed to our brokers’ success. You’re well on your way to closing commercial mortgages! Think APEX first! Our brokers earn more. You can earn up to 5 points on deals you submit, along with up to 2 YSP in most cases. 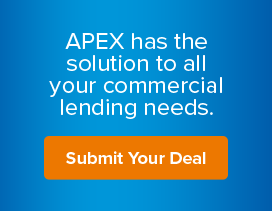 We’re committed to your success, which is why APEX makes it simple to close mortgages. To review a scenario, we only need a completed 1003 or commercial mortgage application, a credit report with scores and tradelines, and an explanation of how your borrower plans to use the money. Your borrower won’t have to pay any upfront lender fees, and we’ll handle all of the processing so you can focus on bringing in new business. We deliver credit approval within 24 hours, underwriting can be completed in 48 hours, and settlement made as quickly as 15 working days from application. Join our Approved Broker program and start providing more commercial mortgages to your small business clients. Our program is designed to reward brokers for sending us repeat business. This program is available to all approval APEX brokers and those currently involved in the approval process. Once you’ve close two deals within a calendar year, you’ll automatically be enrolled in the APEX Repeat Rewards Program. You’ll earn an additional sum for each deal that you close with us, along with additional benefits as you progress. Earn income on deals that don’t fit your matrix. Our referral partner program was designed to make it as effortless as possible for our business partners to earn additional income on applications they turn away because they’re below their minimum loan size. From educational webinars and videos to free marketing support, APEX offers a variety of support tools to help you grow and thrive as a commercial mortgage broker, as well help you drive in more leads and close more loans.